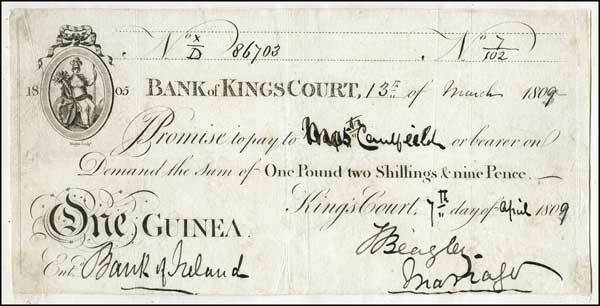 A One Guinea note from the Bank of Kingscourt. An issued version of the Bank of Kingscourt One guinea note dated 7th April 1809. Bank of Kingscourt is the only Private Bank known to have issued notes in Co. Cavan. In addition to the 1 Guinea notes, Post bills for 3 Guineas have also been seen. The unissued example attached dates from 1805-1809 and indicates that the Bank also operated from a Dublin office, address unknown. The design bears a resemblance to Bank of Ireland notes of this era.